Yesterday’s hike revealed a declining state of fall color within the Narrows. There are many photos I would like to shoot back in there, but they all depend on fall color and will have to wait until next year. With Subway and the Narrows officially out of the way, I can now focus my attention on the many small-scale subjects within the park. Last year, I walked away with some great panoramic photos deep within a vibrant maple forest. I want to revisit that forest and see if I can find a composition with my 8×10. I scaled a soft grassy slope strewn with large boulders. The forest floor was carpeted with delicate maple leaves. The wind left its mark on this grove. Through the barren branches, sun-burnt sandstone cliffs stood in place of the fiery display of red, orange, and yellow leaves I witnessed last year. Vast swatches of trees stood barren, while others were still green. I made myself comfortable on the slope. In the distance, several photographers gathered along the rivers edge. This quiet moment gave me a chance to reflect. I pondered the shots I’ve taken thus far. Over the past 4 days, I’ve captured 3 scenes on 8×10 — some of which were years in the making. The knowledge that I might have a portfolio shot in the mix was exciting. I begin each photography trip with a set of goals. I almost always have a particular shot in mind. The mission to capture that photo is what fuels my inner drive, and gives me a strong sense of determination. It’s just like the cartoons where a carrot is dangled in front of a horse. Each photo represents a carrot — but in my case, there are often multiple carrots on multiple strings. With each photo I capture, a string is severed. Eventually, my inner drive is extinguished by my own sense of accomplishment. This has been an interesting trip thus far. With three big shots out of the way, only one carrot remains — another maple photo. Five days remain on this trip. Severing the last string might not be such a good thing. I sat on the slope, pondering my options. A cold wind snapped through the canyon, setting the forest ablaze with a flurry of yellow leaves. The weather forecast called for rain and snow by late afternoon. Today might be my last opportunity to photograph the maples. The impending storm would only perpetuate the rapid decline of fall color. I needed to find a subject. While descending the slope, I stumbled upon an interesting location. 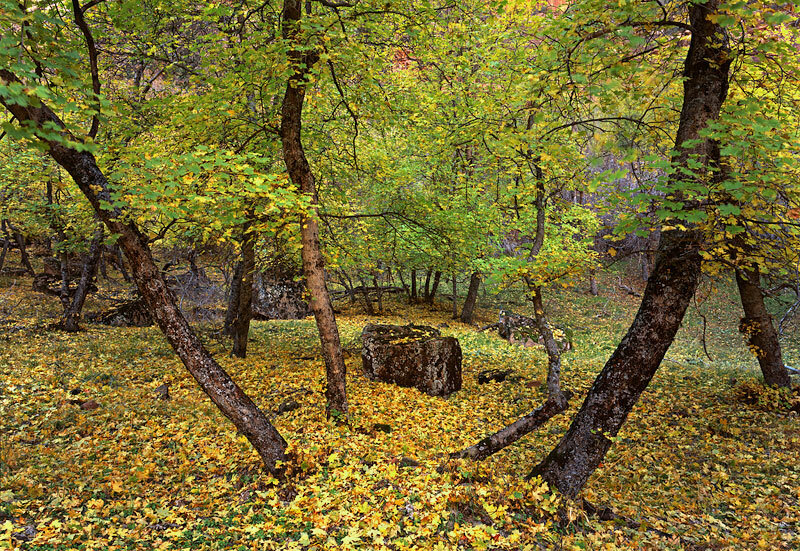 A large square rock floated on a sea of yellow leaves. In the foreground, 4 trees grew outward in an arc of reverence. There was order in the chaos — even the texture of the trees matched that of the boulder. I shot a few frames on my 6×17, but I knew my 8×10 was more appropriate. Unfortunately, it was back at camp. I raced back to camp, swapped cameras, then returned with my 8×10. By then, the wind was gusting, and high clouds streamed past overhead. My first instinct was to use my normal 300mm lens, but the perspective didn’t match up. I tried my 150mm, and found something that worked. The conditions continued to degrade as gusts of wind swept through the canyon. I rushed the composition, and got my camera ready to shoot. The final exposure was 11 seconds @ f/45. Though the photo is technically proficient, It’s not what I was hoping to capture. I’ll definitely revisit this location next year, and see what else I can try. The temperature dropped as the impending storm made its presence known within the canyon. I was excited to see a chance in the weather. Perhaps the rain, and even snow would make for some unique conditions within the canyon. This entry was posted on December 19, 2011 at 12:58 pm and is filed under 8x10, Photo Trips, Photography, Zion National Park, Nov 2011. You can follow any responses to this entry through the RSS 2.0 feed. You can leave a response, or trackback from your own site. I love how that tree shot is composed, reminds me of something Charlie Cramer would do. Only thing I find weak is the color of the leaves. Not peak for sure. The more I see your work the more I’m tempted to try 8×10. Now if I just had any money I would. Thanks Doug. It was definitely a strange year for color in Zion. I’m hoping to shoot this tree again next year (perhaps with an even wider angle lens) and try for a stronger showing of color. This tree, along with many of the other trees in zion were losing leaves while still green. Ben… it was a weird fall foliage season here in the northeast too, with pockets of color often scattered amongst still green trees. Though I wonder how this Zion scene would look with more intense fall colors, I really do like the contrast between the yellow/green leaves and the rich and earthy tree trunks and rocks. Nice work. I also like the look of the green leaves with the yellow floor. I just wish the leaves were a bit thicker. I had to crop off much of the top of this image because of the thin canopy. Perhaps this area would be worth returning to in the spring/summer with a fresh canopy of leaves, and green grass in the foreground. In any case, I’ll put it on my list of future shots. Interesting shot! The incoming storms look like Day 6 might be very interesting. I’m looking forward to the next video.